Greetings! We took a quick break from our Red Friday shopping to check in with you. Hope your Thanksgiving was wonderful and you ate way too much sans any family drama. We had a great holiday too – thanks for asking! Now, if you’re like most of us, you’re probably already freaking out that there are only three Fridays left before Christmas. (Deep breaths. It’s going to be OK, we promise.) Try not to get caught up in the insanity that is holiday shopping/finding perfect gifts and miss out on what the season is really all about: enjoying time with family, celebrating traditions, etc. etc. This year, let’s make sure you don’t get trapped in a mall parking lot fighting over a space. Where should you go instead, you ask? Well, we’ll tell you. Come spend the first weekend in December enjoying holiday festivities while getting some shopping done AT THE SAME TIME. We want you to pack in lots of holiday cheer while checking people off your list with great gifts at great prices. Now that’s multitasking at its finest. PHANTA CLAUS?!? I KNOW HIM! He doesn’t see you while you’re sleeping (like another red suit wearing, ho ho ho-ing guy we know) but he does love bringing joy to everyone he meets. 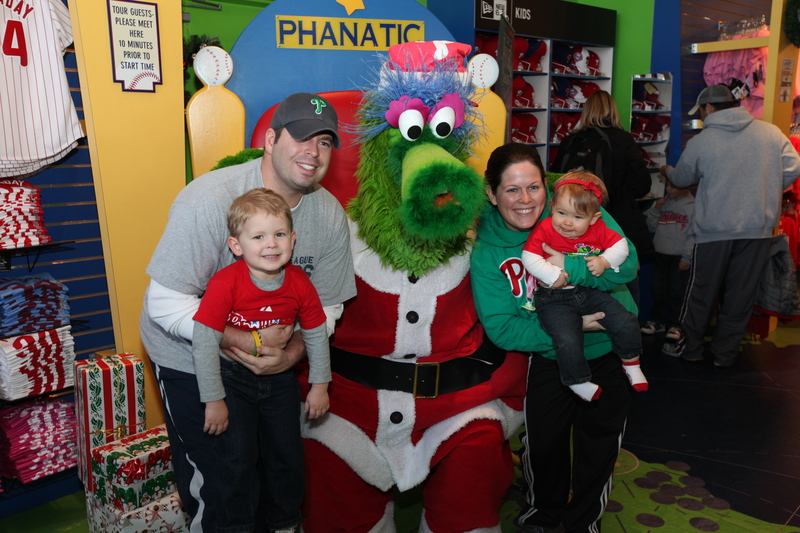 Yes, the world’s best mascot, Phillie Phanatic, is donning the red suit as jolly Phanta Claus. So why don’t you bring your camera (or take your smartphone out of your pocket) and snap some pics with him from 11:00 a.m. to 2:00 p.m. (P.S. 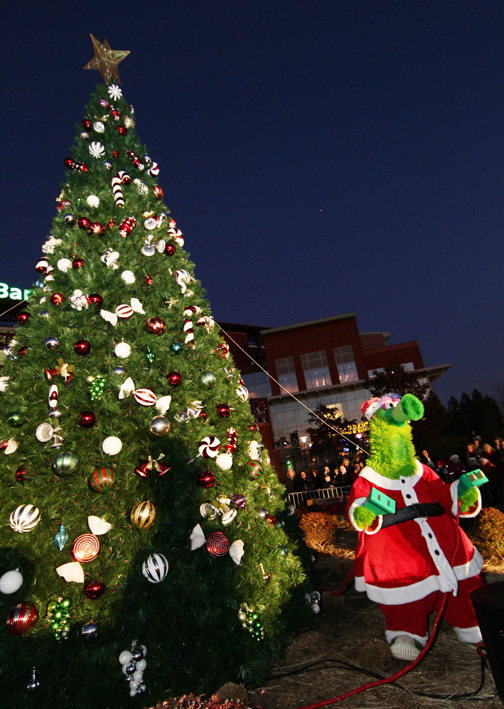 He’s helping light the tree and ballpark later in the day…more info below). Bookworms are the Best Worms. If you have someone on your list who is a Phanatic about reading, listen up. Know the awesome Phillie Phanatic’s Children’s Book Series? Well, illustrator of said series, Len Epstein, will be on hand to sign copies of his work! Check-in with him from noon to 1:00 p.m.
Who Doesn’t Love a Good M&G? That’s meet and greet, in case you didn’t know. 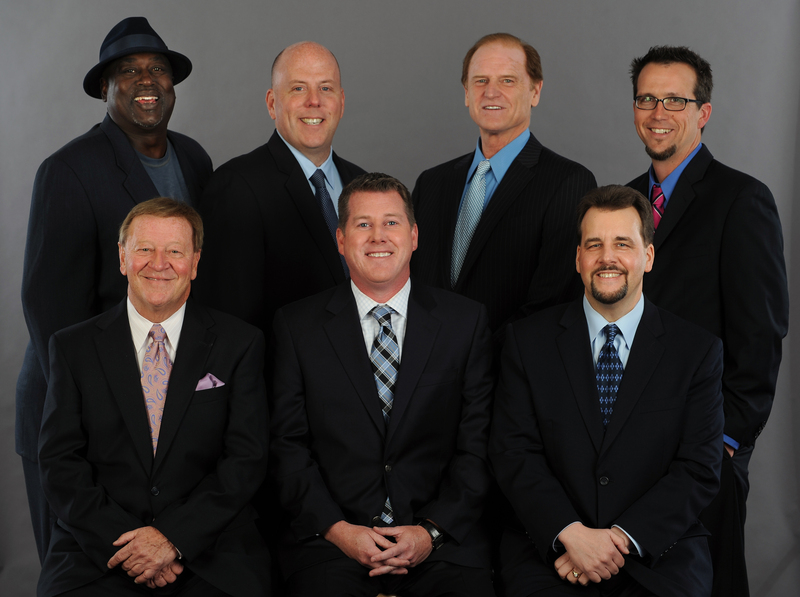 The men behind the microphones, our very own Phillies broadcasters, are meeting with fans from 10:30 a.m. to 11:30 a.m. and 2:00 p.m. to 3:00 p.m. Come say hi! SIDE CHATTER: Shopping Tip from Your Phils – Hit the stores early to get the best selection and deals. The Majestic Clubhouse Store opens at 10:00 a.m. on Saturday, giving you enough time for a good breakfast and caffeine fix before heading over. Get there early and you’ll have first dibs on Phillies Authentics and Phillies Charities game-used memorabilia. That’s right, first dibs! There’s also tons of great Phillies gear and merchandise along with the 2014 Phils’ calendar, ornaments and other holiday-themed gifts to put under your tree! P.S. Store closes at 6:00 p.m., so plan your purchases accordingly. Photo on the Field – One More Time! Haven’t had time to get that holiday card together? No worries – easy as pie. 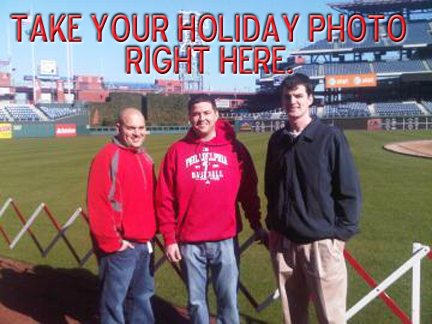 We’re giving you another shot to take your photos on the field. Check out those handsome Phils fans over yonder. But you want a shot of PhanaVision in the background instead? OK, just for you. Oh, and we’re also throwing in a visit to the dugout for good measure. (First 500 fans get to take part, weather permitting, from 2:00 p.m. to 4:00 p.m.). All of the Lights…(Turned On Ceremoniously). There’s just something about a decorated tree that gets you in the holiday spirit. What’s that now? You forgot about our tree lighting? No way! We are beyond excited (like, Buddy the Elf excited) to light our majestic, twenty-four foot Christmas tree along with the rest of Citizens Bank Park in all its holiday splendor. Join Phanta Claus as he leads off the holiday season! Starts at 5:00 p.m. outside, at the Third Base Plaza – so make sure you bundle up! OK, we’ve got to get back to shopping…but we’ll see you next Friday! Can’t wait for Turkey Day?? We can’t either. That fabulous American holiday is just around the corner! We here at the Phillies are seriously psyched for family, friends, overeating delicious food, maybe a little football watching and, after collectively recovering from our food-comas, attending the strategy meeting at the kitchen table for the official first shopping weekend of the holiday season! Part competition for great deals and part tradition, families all over the Delaware Valley will prepare to score the best deals for the best gifts. 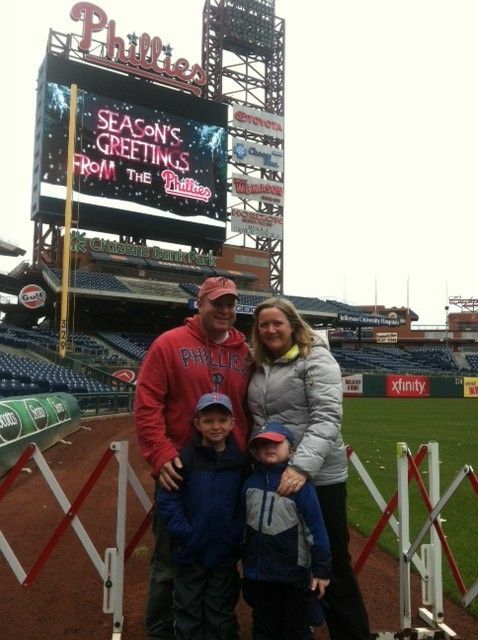 So when your fam starts to plan, you should probably include a stop at Citizens Bank Park – more precisely the Majestic Clubhouse Store, open from 9:00 am to 6:00 pm all weekend long, where Phillies apparel and merchandise is hotter than ever for the holidays. 1. Donuts…in the Dugout…on Friday?! What the what? Yes, we realize you’re going to spend the day before chowing down on yummy turkey and pumpkin pie. But you need your strength to shop – trust me, it’s no joke when sugar levels plummet during a retail excursion, especially as you hunt for the perfect gift. 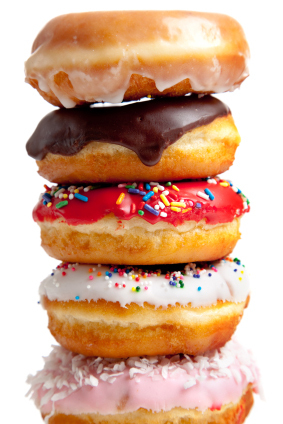 Important detail here: Donuts are truly the bee’s knees of confectionery concoctions. And what better place to get your pastry fix then in the dugout? Yummy donut + pretend to be a major leaguer = nice little Friday. SIDE CHATTER: As with all things related to the holidays, timing is everything. Get here early (doors open at 9:00 am both days) since the best deals (and donuts) are going to the first 500 fans. Oh, field access is weather permitting too – fingers crossed for crisp, fall temps and lots of sunshine! First, check out these awesome Phillies fans getting their photo taken over yonder. Holiday Family photo – check! Then, know this: Whether you’re munching on donuts on Friday morning and/or strolling through the store on Saturday, you can grab your camera and snap some pics on the Phillies’ diamond! Friday’s field visitation will go from 9:00 am to noon & Saturday’s access starts at 11:00 am and goes until 2:00 pm. Again, first 500 fans get to embark on this experience each day – knowledge is power indeed. Gotta love that green guy, right? Did I mention he’s going to be visiting fans for a meet and greet on Saturday from 1:00 to 3:00 pm?? Please stop screaming at your computer/smartphone/other techy-type device being used to read this, thank you. You’ll want to have your camera ready for this one too! Don’t worry about those extra calories on Thanksgiving – go back for seconds and thirds. We encourage squeezing into pants almost as much as squeezing items into shopping bags! 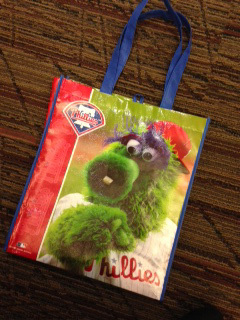 Basically, you fill your free reusable bag (bonus that it’s an adorable image of the best mascot in the universe) with all the Phillies shirts, hats, mugs, ornaments and other loot you can fit and you’ll receive a 30% discount at checkout on the entire bag! This deal is for Friday only – Red Friday to be exact. 5. Presents for giving presents? Tell me more. Are you the person who ends up shopping for you in addition (or sometimes in lieu of) to shopping for those on your list? Me too. Well, consider this a merry, merry treat for you. 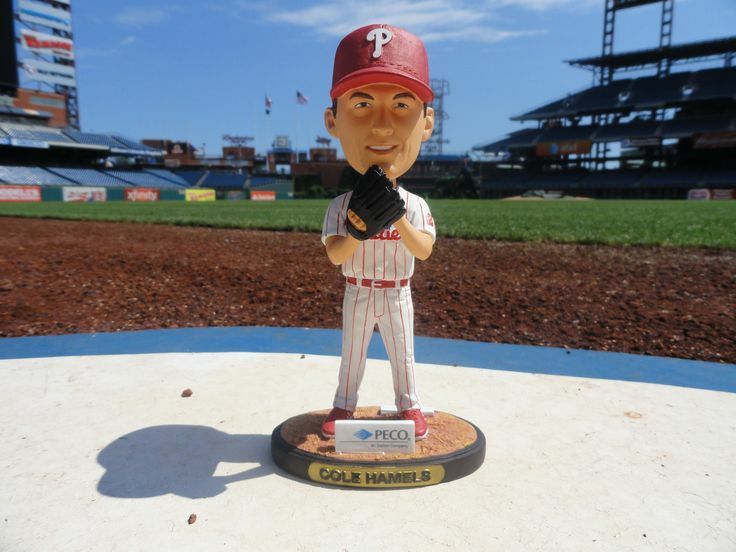 Get a FREE gift with purchase: Friday – Cole Hamels bobble & Saturday – Phanatic t-shirt. These are available while supplies last so get your shop-on earlier rather than later. Yep, Phillies Gift Cards. I know, you’re Uncle Lou is really particular. And you can’t get him another matching sock/tie combo. Grab a Phillies Gift Card, useful for purchasing tickets, merchandise and concessions at CBP, and check him off your list! Done and done. 7. And Phinally…Try our Kiosk – DO IT. Now, this is for Thanksgiving Weekend only BUT select single game tickets will be on sale at the Phillies Ticket Kiosk located in the Majestic Clubhouse Store. (Certain restrictions apply.) And Phillies Six Game Packs are also ready for a place under tree. Oh, and side note: Check out our #ThanksgivingPhandom contest going on now on Pinterest. 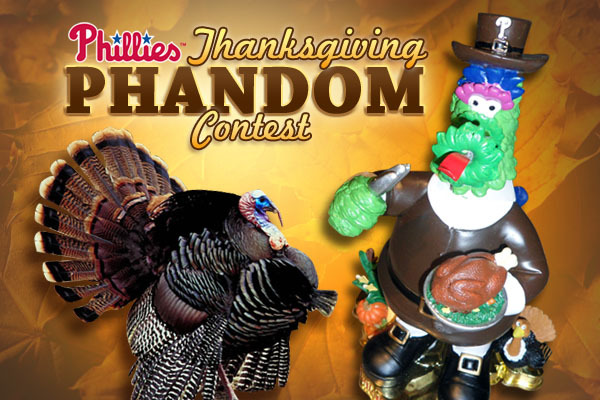 You could win a SOLD-OUT Phanatic Thanksgiving Figurine and impress all your friends just by pinning. As always, get the latest and greatest info on phillies.com. P.S. Next post will have more info on the Phils’ Holiday Sale & Tree Lighting, 12 Days of Christmas, Season of Giving and other fun holiday cheer! Until next time…Happy Thanksgiving to you and yours! So, the offseason is officially upon us and we hope you’re ready for this. We’d like to introduce One Citizens Bank Way, a brand new blog that gives readers little nuggets of information on what’s going on with the Phillies off the field – all year long. That’s right…we’re here for you as the weather turns chilly, into the start of Spring Training and beyond (84 days and counting until Pitchers and Catchers…just sayin’). So, check in with us every Friday for a weekly dose of Phils’ knowledge. Consider it a little addition to your TGIF agenda. We’d really love to see your faces gazing at our posts with childlike wonder. P.S. 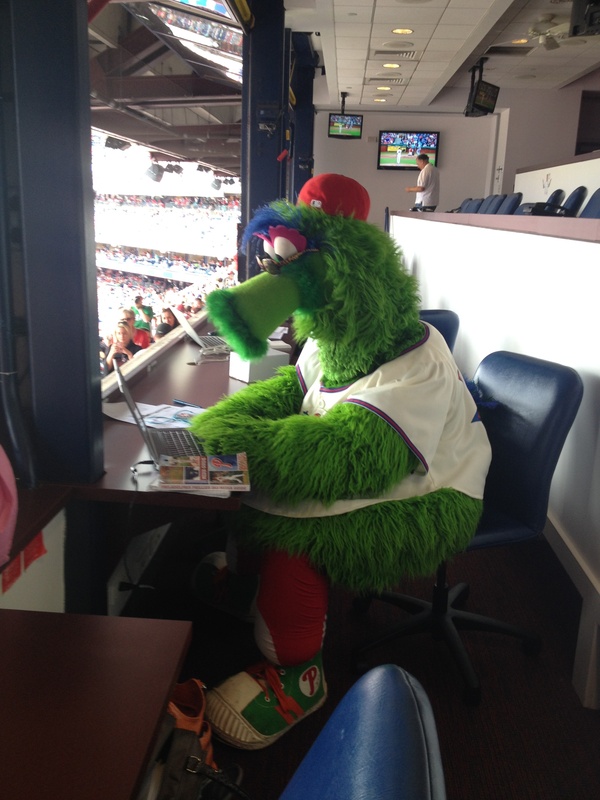 We want to make it clear – Phanatic isn’t the author of this blog. No, he’s not. But he is simply adorable and typing at a computer. OK, that’s all for now – and post #1 is in the books. See you Friday aka tomorrow!